Hello, everyone. I hope all goes well. Something I should probably tackle more on this blog is submissions. Enough of us submit. Enough of us should submit but don’t quite get around to it. Even those of us who are happy as clams to post our poems rather than get into the work of submitting them might be curious to read about a couple of places. I’ll try to remember to do this every now and then [I’ve said that before? Ah. Well.]. About: Some people may be wondering what “CSHS” stands for. It’s a trade secret, but we’re also curious to see what other people come up with. If you can think of something better than the original acronym, we’ll splash it all over everything. Blog post: We want to see your work. You want your work out there. Let’s bump our pens together and make something happen. Submissions Guidelines: You’ve read these a hundred times before, we’re sure, but they bear repeating: yes, of course we are looking for powerful voices that address the liminal space between the concrete and the abstract, the sacred and the profane, in a unique and engaging way. Who isn’t? 2] The Found Poetry Review has posted their challenge for this year’s National Poetry Month and it sounds like a lot of fun… crazy fun. 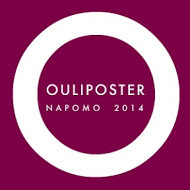 About: Oulipost is the Found Poetry Review’s 2014 National Poetry Month project. It enlists poets to apply Oulipo techniques to text sourced from their daily newspaper. Blog Post: Oulipo — Ouvroir de littérature potentielle (or “workshop of potential literature”) — is a a group of mostly French-speaking writers and mathematicians that seek to create works using constrained writing techniques. Submissions: Poets must apply the day’s Oulipo prompt to text found in the same day‘s newspaper (local newspapers are preferred, but poets may also choose national newspapers). Due Date: Ready to participate? Complete our online form by 11:59 p.m. EST on Friday, March 7. 3] Nicole Nicholson [Raven’s Wing Poetry] has a new journal that has just gone live: Barking Sycamores. Please read the submissions guidelines carefully, as this is not a journal for everyone. About: Barking Sycamores is the creation of Nicole Nicholson, a writer, poet, and autism self-advocate who was diagnosed with Asperger Syndrome in late 2010. Her strong belief in art (in particular, the written word) as a means of communication and expression for autistic people motivated the creation of Barking Sycamores in 2014. Blog Post: We publish poetry by emerging and established writers who are on the autism spectrum or have related conditions. We also seek to add positively to the public discussion about autism in the form of essays on autism and poetics, with special emphasis on autism’s interplay with the creative process. Submissions: We love and appreciate our neurotypical family and friends; however, we regret that we cannot accept submissions about autism or autistic people which are not written by autistic authors themselves. The only exceptions to this are autism and poetics essays (see guidelines below). The reason for this guideline is the need to create a space where primarily neurodivergent poetic voices are heard, especially their contribution to the public discourse on autism. Initial Due Date: Barking Sycamores accepts submissions and publishes poems on a continual basis. They will begin publishing on April 1, 2014. Something for everyone I’d say, so go to it. I shall see you tomorrow for the weekly roundup of prompts; Tuesday for an image prompt; and possibly next Thursday. Happy writing [and submitting], all.